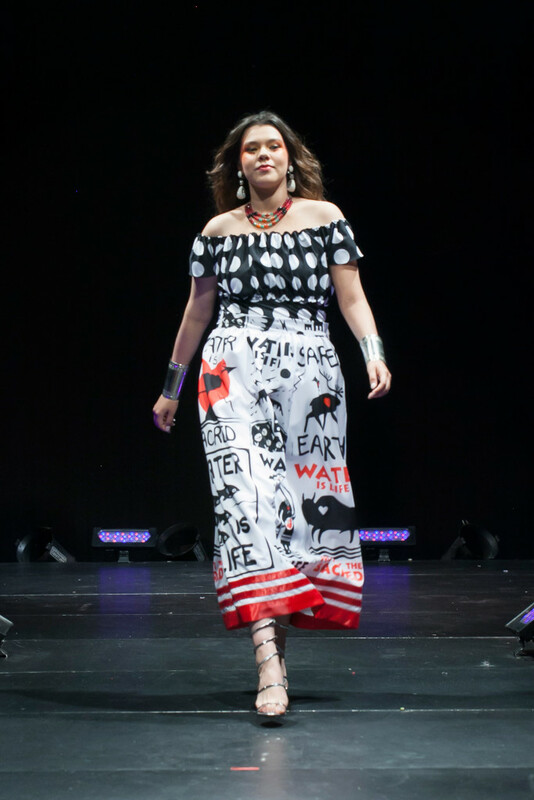 How Delina White Bridges Passion and Activism with Fabulous Fashion. Though she often gets labelled as contemporary when she submits to shows, White still considers herself a traditional artist. 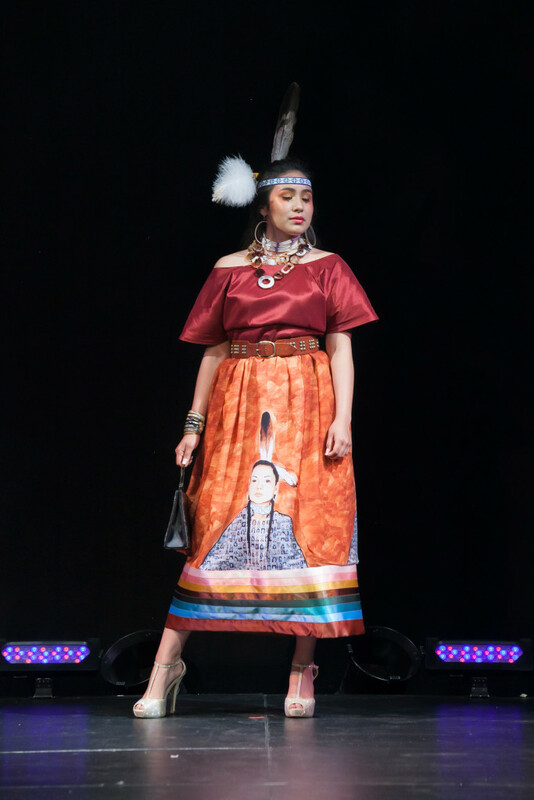 “I make cultural clothing, but my collection here is traditional with a twist.” White debuted her collection entitled, Indigenous Resilience, at Indigenous Fashion Week Toronto (IFWTO) in June. This is an Apache-style skirt and I really liked the white, so I paired it with a polka dot top. It gives off almost a mod look. I took photographs of it in water too, to bring out the ‘Water is Life’ theme. This is the collaboration with Jonathan Labillois. These women are not all Indigenous, but they’re all missing, and that’s a really important message too. I used the image over and over, and added a chiffon layer over it. I wanted it to have a heavenly, kind of ethereal feel to it. I have such a small collection, but I think it’s important we include our two-spirit people into whatever it is that we do. It has a goth feel to it, I wanted it to be like a royal skirt, with the volume. And I thought the fabric looked like tattoos, so when I knew Ziibiwan was going to wear it, I had them put on temporary tattoos. 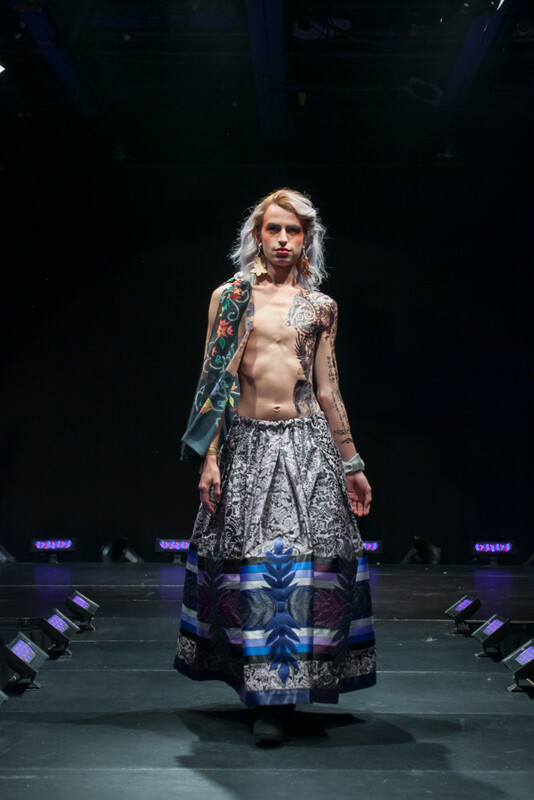 It’s designed to show both pride in identity and culture, although anyone can wear any of my skirts. The entire collection is called, Indigenous Resilience, so I thought it appropriate to show the barriers all members of our community have resisted. 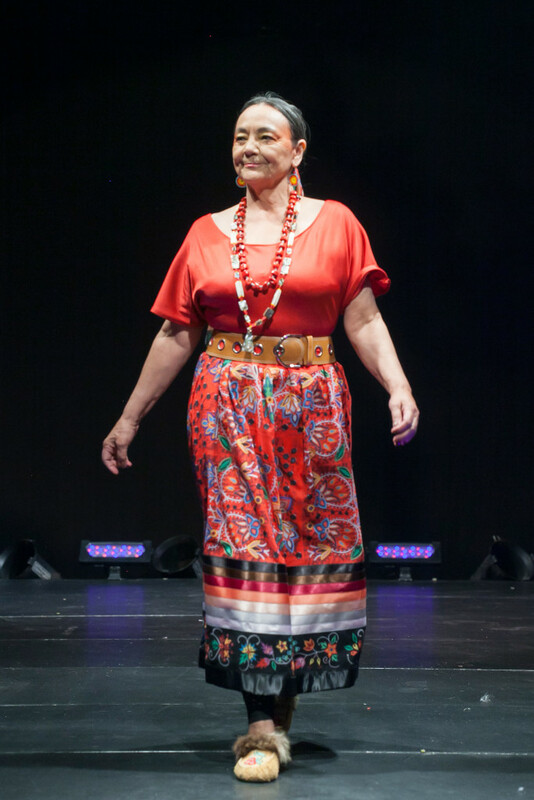 This skirt was designed with fabric I had made based on my beadwork. This one is a part of me, part of my beadwork, it’s definitely Indigenous. 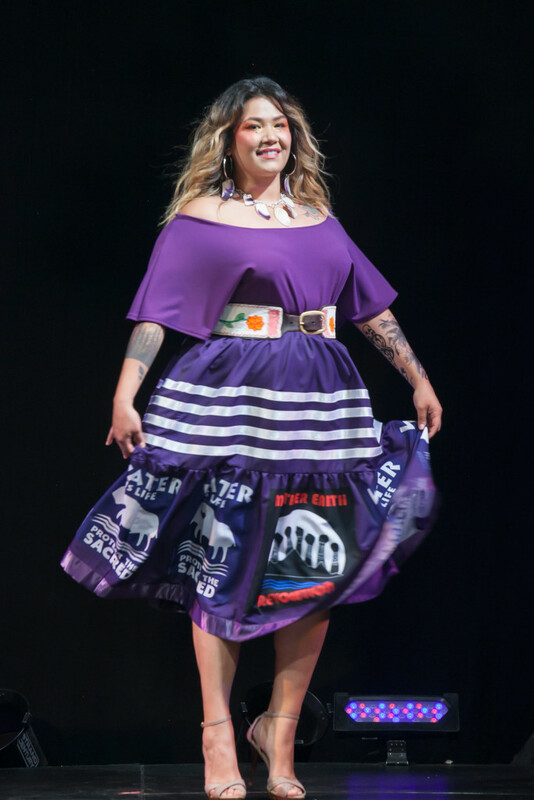 This is my "Mother Earth Revolution" skirt. And as you can see, I left the artists’ names on there, Christi Belcourt and Isaac Murdoch, because they deserve the credit too.